Dexamethasone treatment suppresses CHS but is ineffective when applied during the sensitization phase. (A) Beginning at day –1 and continuing for 7 days, mice were treated with either PBS (rows 1 and 2) or dexamethasone (Dex; row 3). On day 0, mice were treated on the shaved back skin either with vehicle (row 1) or with DNFB (rows 2 and 3). All mice were challenged with DNFB at the ear on day 5, the effect of which was determined 24 hours later. *P < 0.01 (n = 6). (B and C) Wild-type mice were injected i.p. with either dexamethasone or vehicle. Twenty-four hours later, they were topically treated on the shaved back skin with the fluorophore FITC. After 18 hours, cells from regional lymph nodes were analyzed by flow cytometry. (B) FACS analysis of lymph node cells was performed to determine the level of expression of CD11c and loading with FITC. (C) Numbers of FITC-positive cells after treatment with either FITC alone or FITC in combination with dexamethasone. *P < 0.01. 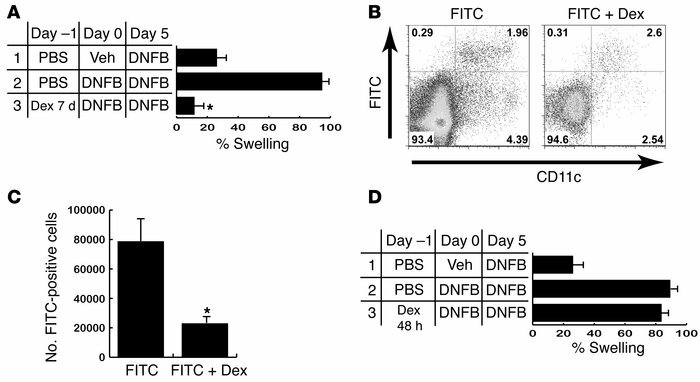 (D) Mice were treated as described in A except that the dexamethasone treatment was terminated at day 1 after DNFB sensitization (Dex 48 h; row 3) (n = 6).